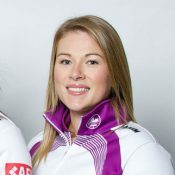 Kristin MacCuish, like so many other curlers, grew up at the curling rink. She aspired to follow in her aunt Jill (Officer)’s footsteps, and says watching Jill was what prompted her to begin curling at age 10. Now, Jill and Kristin regularly face off against each other at tournaments. Kristin’s most memorable experience so far was winning the 2016 Manitoba Scotties Tournament of Hearts – she sees it as an indicator of her team’s hard work over the previous two years (in which they’d finished second both times at the tournament). Earlier this year, Team Einarson represented the province at the 2016 Scotties Tournament of Hearts in Alberta. In addition to the focus and skill required on the ice, Kristin loves the social aspect of curling, and the unity among fans and athletes of all ages. Eventually, she hopes to compete at an Olympic Games and become an Olympic Gold medallist just like her aunt.